Hey there friends! 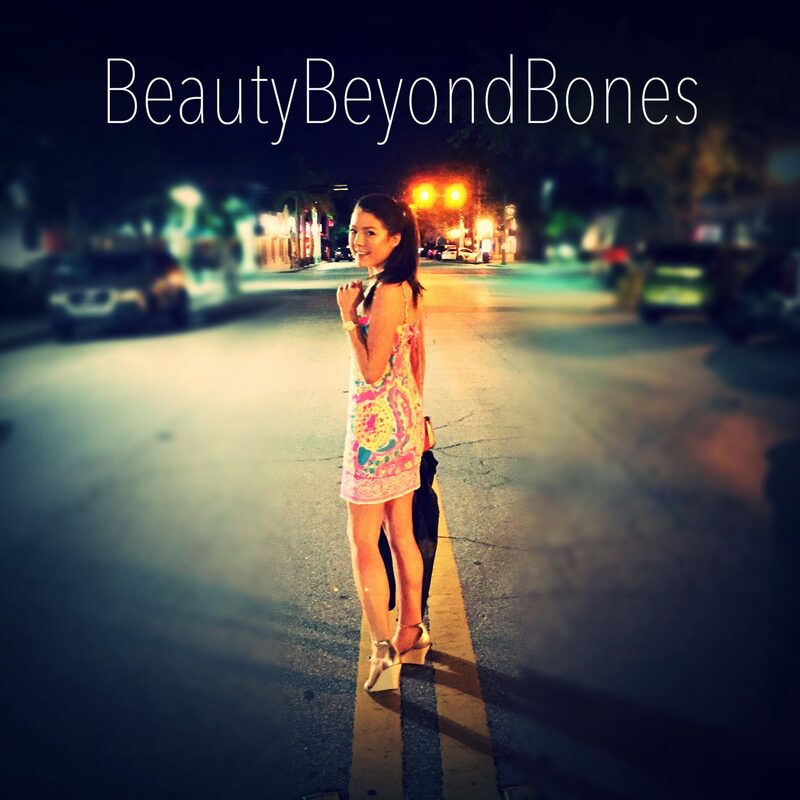 I hope you all had a wonderful and relaxing Memorial Day Weekend! I’ll tell you what, there’s nothing quite like barbecues with friends. A little corn hole, a couple cold drinks, good food and good company, and I am in my happy place! But I will say, sometimes, cookouts can be a little tough to navigate, being on the Specific Carb Diet for my Ulcerative Colitis. Luckily though, I have come up with some great travel-friendly recipes that are perfect to bring along to BBQs, if say, burgers and brats aren’t your thing. 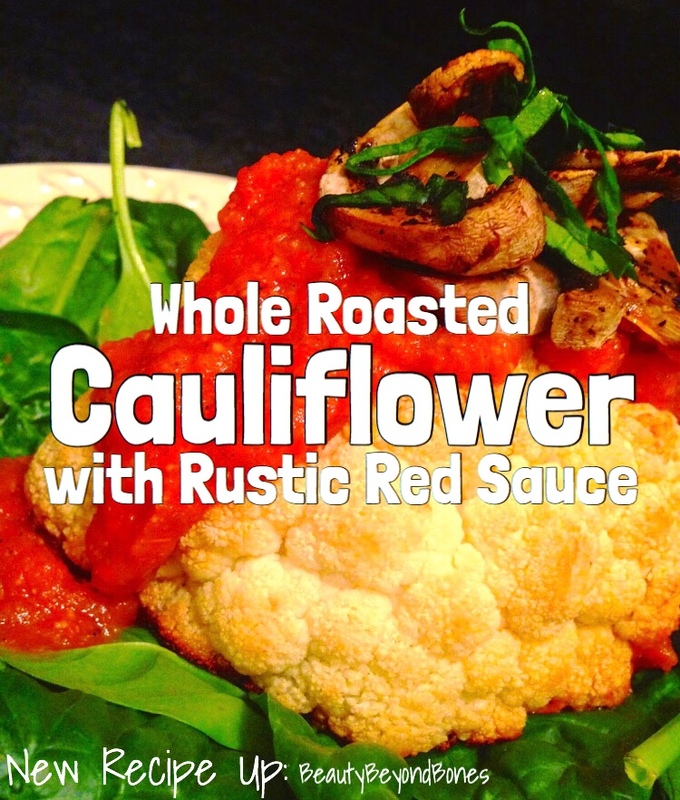 Enter my whole roasted cauliflower with rustic red sauce! Half a head of cauliflower, roasted to golden brown perfection, topped with a beautiful tomato sauce and fresh basil. Y-U-M.
It’s show-stoppingly gorgeous, healthy and delicious too. Plus, it’s Grain and Gluten free, Vegan, Paleo and Specific Carb Diet friendly. In the meantime, make your sauce. In a skillet over medium heat, sauté the onions and peppers in 1 Tbsp olive oil, salt, pepper, and herbs de provence. Let them soften for about 5 minutes. Add the garlic and let it cook for another 3 minutes. Finally, add the tomato and let it cook for another 4 minutes. Carefully transfer to your food processor, and process until smooth. Finally, brown the mushrooms in the skillet. Heat 2 tsp EVOO over medium-high heat and let them cook about about 3 minutes per side. A trick to really nice browning with mushrooms, is to let them cook (untouched) for 3 minutes per side. When you stir them around and have them moving a lot, they are unable to get that nice golden brown caramelization that we’re after. So let them cook untouched until it’s time to flip! To assemble, place the cauliflower on a bed of spinach. (You can dress the spinach lightly with a olive oil and balsamic vinegar.) Top the cauliflower with the tomato sauce and mushrooms and garnish with fresh basil. Serve warm, or if you’re traveling with it – at room temperature. My goodness, what a delightful supper! The perfect tag along to any backyard cookout that is sure to make your neighbor, Karen, have some serious food envy. But seriously, it was such a stunning dish – with the golden brown outlines of the cauliflower, and the bright red tomato sauce. It was so beautiful against the bright green from the spinach and basil. And the sauce was wonderful. The herbs de province gave it a warm and cozy flavor that had a delicate sweetness to it. And the basil gave it that nice *pop* of freshness. Alright, I hope you all have a wonderful night! I’m getting up before the sun tomorrow morning for an all day shoot! So early to bed for me tonight! See ya tomorrow for programming as usual! Yum! I’m trying to find better things for me than I’ve eaten lately. I’ll be pinning this and giving it a try. It does look tasty! I hope you had a great Memorial Day weekend too. This looks really good! Quick question… do you have a substitution for the mushrooms or can I leave them out? I’m not really a fan of mushrooms because of the taste and texture. Do you think it would alter the taste to leave them out? or is there another alternative that you would recommend without changing the entire dish? Thank you for sharing your recipe. The recipe in my vid is VERY healthy with the rice pasta! Have a full head of cauliflower seating on my fridge. Going to try this out. Looks delicious. So creative! 😀 Thanks for sharing. I’m sorry, I just had to know what a corn hole was as we don’t have them in Canada. I looked it up for a recipe and found it isn’t a food, but a game. That was to funny. This looks good Carolyn. Although I don’t enjoy eating cauliflower, I will definitely try this. I cannot wait to try this! Thanks for sharing! I had trouble “Liking” your post. Computer problem I guess but I did enjoy it and think I may try the cauliflower. I may have to do a variation on the sauce for my husband. He isn’t a fan of tomato sauces. Oh gosh I’m sorry about the trouble! Pesto would be a great option for a substitute sauce! Or even a curry sauce – yum!! Thanks for the suggestion. The pesto would probably work best for my husband. Oooooh! Yum. I definitely want to try this out for myself. And, I love the baked eggplant parmesan idea! Please post that one!! Who doesn’t love cauliflower . . . especially when you’ve elevated it like this?! Nummm!!! Delicious! Right up my alley! So… I mentioned your blog in a recent post Bloggers Support Bloggers Award because I wanted others to know how supportive you are. I mentioned it in a section that is not part of the nomination because I know you are award and tag free. May God bless you for your heart for others, Caralyn! Oh my gosh Gail, thank you for saying that. You seriously have no idea how much I appreciate the encouragement. I was actually thinking this morning whether or not I should continue with them because I didn’t know if people liked them or if they were annoying. So your affirming words really touch my heart. You are awesome. Thank you. And thank you for mentioning my blog! I am truly honored. Sending big hugs to you!! My how God moves and speaks for Himself! Praise His name for allowing me to be a part of anything He would be passing onto one of His dear children! Big hugs to you as well! Me and God have faith in you! This is gorgeous. Will have to try it.